The Latins and the Latin-minded never ceased working to have Cyril removed. By paying a large sum to the Turks they succeeded on 7 March of 1634 and they exiled him to Tenedos while elevating to the Throne Metropolitan Athanasios Patellaros of Thessaloniki. This illegal move however did not last long because after a month Athanasios was removed and the canonical Patriarch Cyril returned triumphantly to the Throne. The continuous failure of the Papists to remove Cyril and install a Patriarch of their liking did not frustrate them, instead it made them tougher in their war and more determined in their approach. Their most sure weapon against him was the forged Confession. Cyril responded to these accusations when he wrote an apologetical letter to the Brotherhood of Leontopolis, which was founded by Saint Meletios Pegas, and to all the Orthodox Christians in southwestern Russia, in which he renounced Calvinism, being an indirect repudiation of the Calvinistic Confession. Again, in March of 1635, the Jesuits moved against Cyril, and by dishing out a lot of money they were again able to achieve his removal, elevating Kontaris to the Throne, who had the now elder Patriarch arrested and confined. According to a document of the Austrian Ambassador Schmidt, Kontaris and his gang thought about blinding and poisoning Cyril. Schmidt thought about holding him prisoner in the Austrian Embassy, but he was afraid that his voice would grab the attention of Greek neighbors. At the suggestion of the Ambassador it was decided to follow the decision of the Council of Propaganda and for a ship to be chartered by trusted crew members to take the Patriarch as an alleged exile to Rhodes. The captain of the ship had a mandate to approach the first pirate ship they encountered, and with the signature of the Austrian Embassy they would hand over Cyril to deliver him to Malta. In Constantinople the news would then circulate that a ship from Malta had captured their ship on which the Patriarch was aboard, and they carried him off to their island. After a lot of negotiations and deferrals they found the ship and its crew and the Metropolitan was given the documents of the Austrian Embassy which would accompany the prisoner Patriarch, but the Netherlands Embassy succeeded in discovering through a spy to learn of their plans. The crew was acquired and brought the ship to Chios, where the admiral of Rhodes Bekir Pasha was, a friend of the Patriarch, who took him under his protection in Rhodes, where he remained until the middle of 1636, when he returned to Constantinople. Meanwhile Kontaris was deposed after a rebellion of the Hierarchs and elders, and he was exiled to Rome. Neophytos III was elected Patriarch. Rome was watching with interest to what was happening in Constantinople, receiving constant updates from the Austrian Ambassador. In June 1636, Pope Urban VIII called for a special meeting in Rome to decide how they could complete the final removal of Cyril and those like-minded to him. In March of 1637 Patriarch Neophytos resigned and Cyril again returned to the Throne. He was already at an advanced age and his opponents could have waited till his physical death to implement their plans. But because he continued to fight on behalf of Orthodoxy and against the papacy, the Jesuits were convinced that he was indomitably "the great old man" and therefore decided to seek by all means his death. The Jesuits and the Roman Propaganda found a willing tool once again in Cyril Kontaris. He had escaped Tenedos and came to Constantinople. To prevent the Church from new riots the Hierarchs met with him and offered that he reconcile with the Patriarch and receive some Provinces, so he can settle down and abandon his scheming. But he knew that Rome had already decided on the death of the Patriarch and refused and affectionately signed a Latin confession of faith and promised to subject the Eastern Church to the Pope, with the promise from the Propaganda that as soon as he took the Throne and eliminated Cyril he would receive a fee in the amount of 4,000 coins. The actions of the enemies of the Patriarch gave the results they expected. In June of 1638 Schmidt, who was in constant communication with the Propaganda, succeeded in removing Cyril from the Throne and presented the accusations to the Turkish authorities that he was preparing the Russians for an attack against Constantinople and a revolution of the Greeks. Sultan Murad IV, who was on a campaign against Baghdad, accepted the accusations with the recommendation of the Grand Vizier Bayram Pasha, and ordered the Patriarch to be arrested and killed. Cyril was arrested by prison guards headed by Ahmet Aga on 22 June and was taken to the fortress Rumeli Hisar, where he was imprisoned. Cyril was unaware of the content of the Sultan's orders. On 27 June 1638 fifteen Janissaries arrived at the fort along with other senior government officials, who took him and boarded a boat. When Cyril asked the purpose for boarding, they replied that he was being brought to exile, and the ship that would carry him was waiting at the beach of Agios Stephanos to transfer him to the place ordered. When they arrived there and the Patriarch saw that the ship they expected was not waiting for them, as the Janissaries told him, he realized that his martyric death was decided. He knelt and prayed to God with tears. The sun was in the west and as soon as night was coming they set him on the beach and strangled him with a rope. The next day the people learned of what happened, when the Janissaries wanted to sell in the marketplace the Patriarch's clothes and personal belongings, and they rose up against Kontaris, who pretended he had no knowledge of the matter. Certain people visited the Kaymakam of the City and offered him money in return for the body of the Patriarch, but he refused. His body was casually buried on the beach of Agios Stephanos but after three days men of Kontaris dug him up and had him thrown into the sea, lest the Christians find him. Some fishermen found him however, or according to others, he was found by Christians who sought for him, and he was secretly transferred and buried at the Monastery of Saint Andrew, on the homonymous island in the gulf of Nicomedia. Three years later, in 1641, the then Ecumenical Patriarch Parthenios I the Elder (1639-1644), a friend who was like-minded with the Martyr Patriarch, took care for the translation and transportation of the relic of the Patriarch, and after the chanting he gave a mandate that it be transferred to the Monastery of Panagia Kamariotissa in Halki, where the predecessor of Cyril, Timothy II, was buried in 1620, and he was placed in the sacred Sanctuary of the Katholikon of the Monastery below the Holy Altar. From the Monastery of Kamariotissa he was moved to the Patriarchal Treasury, and in 1975 was given by Ecumenical Patriarch Demetrios I to the Holy Monastery of Agarathos, the Monastery of the Great Hieromartyr Patriarch, where he can be found today. The patriarchate of Saint Cyril proved to be salvific for the Patriarchate and the entire Orthodox Church. His presence demonstrated to be the work of Divine Providence. He loved the Church and gave everything for it from all his strength, defying risks and sacrificing his very life. He, like another Atlas, held on his shoulders the Church and the Nation, fought against by both foreigners and our own, in a difficult and dangerous time for ecclesiastical matters. The political expediency of the time, the papal aspirations in the East, the expectations of the Protestants which were not vindicated, had as an effect that throughout his entire patriarchal ministry he was fought against with slander expressed in the most rude ways. But he firmly held on to the ecclesiastical rudder, without fear of the storm raging around him, and he did not let go until his strangulation by bloodthirsty Janissaries. 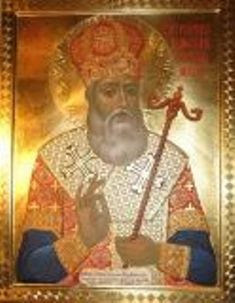 Meletios of Athens in his Ecclesiastical History described him as "a man educated in education and virtue,"11 while Dositheos of Jerusalem writes with gratitude for the care he took for his own Throne in Jerusalem: "Cyril of Constantinople helped the Throne of Jerusalem with its debts in two ways. On the one hand he taught in Constantinople and Galata, vehemently prompting the Christians, and those lovers of Christ ably helped; on the other hand he invited to the Patriarchate rulers and nobility and foreign admirals to make a register, gathering a lot of money for alms. "12 Elsewhere Dositheos refers to the mindset of Cyril when he writes: "Cyril Loukaris served as Patriarch first of all as an Orthodox, and he died in communion with the Church, namely the Orthodox. "13 The great fighter for Orthodoxy Saint Eugenios the Aitolos wrote his Life and Service,14 recognizing him as a Saint and Martyr of the Church, who was persecuted and deposed by Kontaris and his gang. Although synodically Saint Cyril was vindicated,17 as far as his Orthodox convictions, the criticisms against him did not stop.18 Critics have repeatedly reinforced the argument against his Orthodoxy with the accusations and slanders of the Papists, Protestants and the list of his clerical enemies. The Act of the Patriarchate of Alexandria, which included his name in the List of Saints, has restored the truth about his person and stamped it with the official ecclesiastical recognition of his holiness as a Fighter, Confessor and Martyr of the Church. 11. Ἐκκλ. Ἱστορ. Τόμ. Γ’, Βιβλ. ΙΖ’, κεφ. Α’, παρ. 6. 12. Περὶ τῶν ἐν Ἱεροσολύμοις Πατριαρχευσάντων, Βιβλ. ΙΒ’, κεφ. Α’, παρ. 7. 13. Περὶ τῶν ἐν Ἱεροσολύμοις Πατριαρχευσάντων, Βιβλ. ΙΑ’, κεφ. Ζ’. 14. Ὅσιος Εὐγένιος ὁ Αἰτωλός, Βίος καὶ ἔργον, Ἡ εἰς ἅγιον ἀνακήρυξις, Ἀσματικὴ Ἀκολουθία, Ἀθῆναι 1983, σελ. 29-32 καὶ 61. 15. Μάρκ. Ρενιέρη, Κύριλλος Λούκαρις ὁ Οἰκουμενικὸς Πατριάρχης, Ἀθῆναι 1859. 16. Κωνστ. Σάθα, Νεοελληνικὴ Φιλολογία, σελ. 246. 17. "A Synod of Constantinople recommended in 1635 to anathematize the forged confession of faith issued in the name of Cyril. This decision was made by another Synod in Iasi gathered afterwards by Parthenios the Elder. And a third Synod in Jerusalem (Bethlehem) gathered by Dositheos in 1672, anathematized the cacodox booklet of Pseudo-Cyril, inferring through clear proof, that he was not the author of this impious constitution, proclaiming that: 'This Cyril, as one Calvinist-minded, has never been recognized by the Church.'" Γερ. Μαζαράκη, Συμβολὴ εἰς τὴν ἱστορὶαν τῆς ἐν Αἰγύπτῳ Ὀρθοδόξου Ἐκκλησίας, Ἀλεξάνδρεια 1932, σελ. 235. 18. Prof. Adamantios Diamantopoulos in his study "The Alleged 'Confession' of Cyril Loukaris", which was published as the introduction to the study of the Archbishop of Athens Chrysostomos Papadopoulos titled Cyril Loukaris, certified by unshakable arguments and evidence that the confession is not the work of the Patriarch. See Χρυσ. Παπαδοπούλου, Ἀρχιεπ. Ἀθηνῶν, Κύριλλος ὁ Λούκαρις, ἔκδοσις Β’, Ἐν ἀθήναις 1939, σελ. θ’-λγ’.